My husband isn't too fond of Shark Week; he enjoys surfing and wants to continue to enjoy surfing:) Of course, we all know that sharks live in the ocean, duh, but lately there have been multiple sightings locally, four to be exact! When my husband and his friend showed up at the beach to surf on the morning of August 2nd, this warning sign (above) was posted. Gulp. 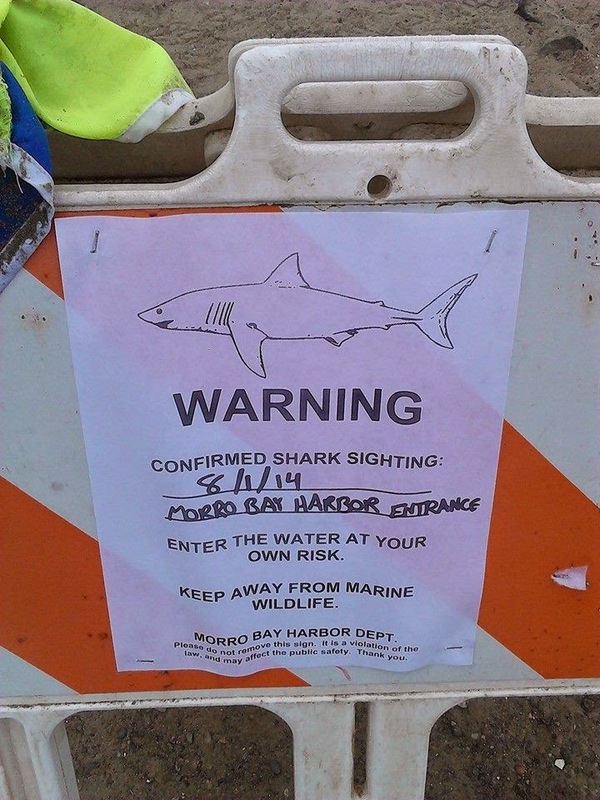 (Later, this warning sign had additional info added: the size of the shark was estimated to be 18-19 feet!) Yikes! Yes, they went surfing anyway. A couple of weeks ago, my husband arrived at another beach and was greeted by a friend that had witnessed a shark attack just 30 minutes prior, but fortunately, the shark merely bit the surfboard (it came around twice!) and not the surfer! Whew! The warning sign was the inspiration for these cookies and since I am all about "simple" I came up with this "not too scary" shark fin cookie. Of course, if I was in the ocean and spotted a fin, it would be VERY scary! 1. Cut out and bake cookies according to recipe. 3. Add one drop of royal icing (per cup) to make the gray. 4. With a #3 tip, outline and fill the fin cookies. 5. Set aside to set/dry the icing for a bit. 6. Mix some of the royal blue into a portion of royal icing, and some of the electric blue into another portion. The consistency should be on the thick side. 7. Using a small, offset spatula, spread the icing on the round cookie (some of each blue shade), free form. (I also swirled in a tiny bit of white.) Use the spatula to also form some small peaks. 8. Gently, but firmly, place a fin onto the middle of each round cookie. It should hold up easily. 1. With a #3 tip outline the cookies with white royal icing. 2. Using a #5 tip, fill the cookie with white royal icing. 3. Let cookies dry overnight. 4. Using the black edible marker, sketch a small shark and the warning. 5. With an orange food marker, add the orange stripes. WOW, I can't believe how many shark siting's there have been and for your husband to surf - YIKES that is scary! Tell him to stay home and eat one of those adorable cookies you created! Your husband is brave, but a bit crazy too =) My husband has gone scuba diving with sharks and I think he is totally crazy. I can't even watch shark week on t.v. LOVE these!!!! Also, no way. Uh uh. Not going in that water. Thanks, Michelle! You guys are so lucky with the warm water down south; I'd be much more tempted to go in! It's a combination of brave and crazy, Lisa, and I think he just tries not to think about it. :) Thanks for commenting! Your husband is crazy! He should come to Wisconsin to surf in Lake Michigan...no sharks. Though he would probably have to surf in the winter when supposedly the waves are better. I'm not joking. People do it! :) Love the cookies, Sue! I've never thought of surfing on a lake! Maybe someday:) There are many surf spots here that are much better in the winter also. Thanks for your comment, Melissa! YIKES SUE!! Tell your hubby these shark cookies are close enough to sharks! He needs to be safe. I think he should ask for one of those chain suits that stop sharks from biting. I think that is the perfect Christmas gift for him!!! Cookies are adorable and your hubby is very brave! That's pretty scary about those shark sightings....and that your husband went in the water anyway! Praise the Lord he was kept safe! Wow. Anyway, I really like your cookie sharks and sign....much, much preferred over real sharks! These are so cute..just in time for my beach vacation! Glad your hubby stayed safe..much braver than I. I remember several years ago, we had numerous shark sightings in the gulf..hopefully that won't be the case during our visit! 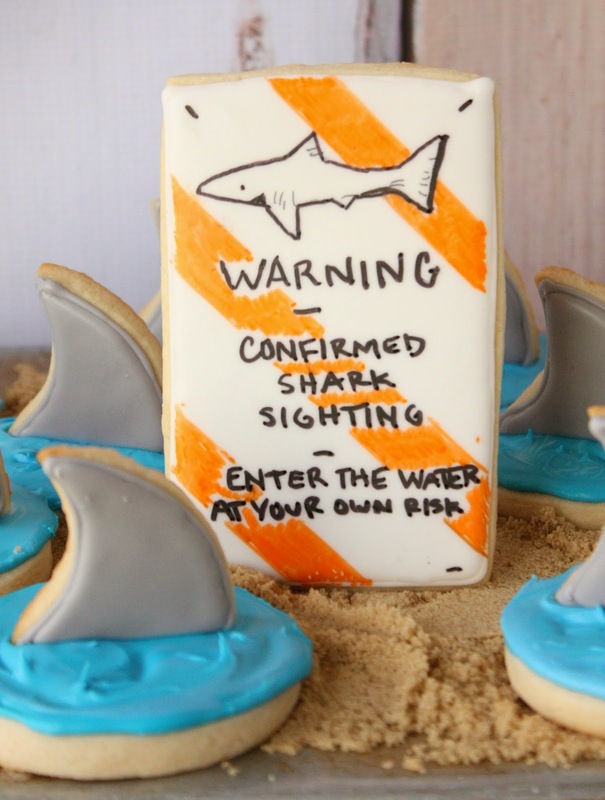 I'll take my sharks in cookie form any day! Yes, I wouldn't have wanted to get in the water with that sign up!